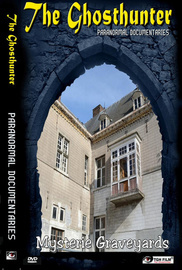 Mysterie Graveyards is a documentary about paranormal activity. Based on the truth. This series of movies starts In the house of the infamous child abductor and murderer Dutroux. Before we even entered with our hidden camera, a loud knock on the door was heard.The house was filled with a paranormal tension and Joost the exorcist captured many different entities. 2. Mysterie of the dead : The cemetery Campo Santo in Gent Belgium. A murderer was killed by the Russian maffia and he could not leave the living alone. An exorcist makes an end to this and now the living no longer suffer from the dead. 3. A door is slammed shut in a haunted villa! The cameraman is alone in the room and gets scared the hell out of him! 4. Monastery of the fathers in Trier Germany. There are paranormal clues in this monastery and especially its old tunnel has an enormous tension to it. Who is this one father that still dwells in this place? 5.Chateau Noisy a.k.a 'Castle Miranda'. They say it is haunted. But The Ghosthunter has said many years ago that the castle is not haunted by evil, something else is at play here. A female spirit is not allowed to leave.